I saved te zip to my desktop... now where do I unzip them into? I like the steelz windowblind, so I am anxious to try this. river55IL If you downloaded the Steelz windowblinds skin, then you already have these animations. (they are included with the skin). Make sure you have them selected in the "my animations" section of WB config. I only uploaded them here so that if someone didnt want to dowmload the WB skin. they could try the animations without the whole skin. What exactly should be checked in My Animations? I don't understand what they mean there.
. Always use the animations defined in the current skin.
. If the skin has animations defined, then use it, otherwise use the animations selected below.
. Always use animations selected below. Next, use the horizontal scroll and choose your selection. My animations are "steelzanimations". 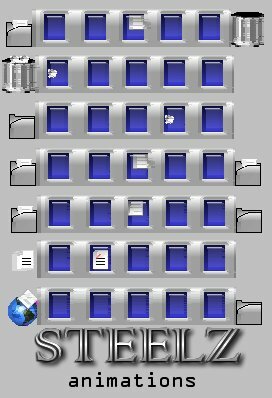 You'll see these animations when you do windows taks such as: copy a file, delete a file, download from the web, etc. Hope that clears things up for you. Thanks, I will have to look at it again.